Jumppa is a care-free sweater for all kinds of dogs. It fits comfortably and warms from head to tail. Jumppa is anti-static, which means it will not tangle your dog’s fur or collect hair. The material of Jumppa’s back panel was chosen due to its high flexibility, which makes Jumppa easy to put on and comfortable to wear. The bottom part protecting the dog’s upper chest and abdomen is made of thermal tricot. The smooth outer surface is water-repellent and the inner surface is soft and warm. Jumppa’s materials have good insulation qualities and they absorb very little moisture, which ensures that your dog is comfortable also in rainy weather. 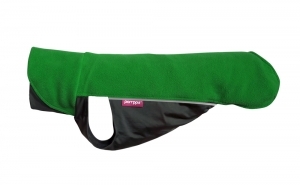 The back cut of Jumppa covers the dog’s thighs and keeps them warm. A generous collar covers the neck. Thanks to the stretchy gusset in front, the collar does not restrict head movement. The reflectors along the side seams ensure your dog is seen in the dark. 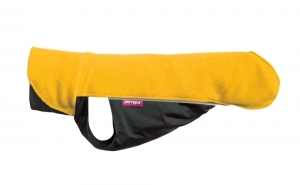 Jumppa is also suitable for warming your dog’s muscles after a swim. Moisture-wicking materials help your dog’s fur dry quicker.